Need a baby gate, but want something you can easily move around? Whether you need something portable or just don’t want to screw something permanently into your walls or door jambs, then you might be a candidate for a pressure-mounted baby gate! These are so handy because you can both install and remove them in a jiffy, as they don’t take any special tools, and they function by way of a spring tension rod mechanism. The biggest advantage to a pressure-mounted baby gate is essentially that they are convenient. You don’t have worry about screw holes, you can section off different portions of the house, if necessary, or you can throw it in the car and take it to Grandma’s house. The disadvantages, however, are that they are not recommended for use at the top of stairs, they can (if installed incorrectly or pushed on too hard) slip and fall over, and they also have the potential for marring your walls or door jambs. If you want to avoid damage, look into purchasing a set of Wall Savers, which are great little additions made of molded rubber that are designed to hold the “feet” that push against the wall, thus protecting the surface from wear and tear. Just slide them into position, as there is no need to mount them, because the surface tension holds them in place. 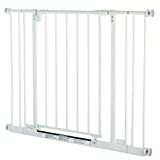 Wondering which pressure mounted baby gates are the best on the market? Take a peek at this list to find out! This multi-directional pressure-mount baby gate is definitely a top pick with its triple-locking latch system. It is easy to use with one hand and has a convenient “hold-open” option for multiple pass throughs. Plus, it is simple to install and expandable. The great thing about pressure-mounted baby gates is that not only do they come in standard sizes for everyone with regular doorways, but they also come in “wide” sizes for unconventional openings. The fact that these gates can be a solution for both standard and wide areas is a real bonus, but keep in mind that any one gate cannot do both, as they are not versatile between these needs. It is important that you carefully measure the width that you are needing, because most pressure-mounted gates can only be extended a few inches with special extension rods, so you need to buy a gate as close to the correct size as possible. For extra-wide spaces, keep in mind that a pressure-mounted gate, even if it “technically” fits, may not be a great choice, because it may be too short to hold the proper amount of pressure and may be prone to buckling or being wobbly. Also, keep in mind that pressure-mounted gates must have two solid surfaces to push against, so if you have uneven surface heights, round dowels or banisters, or walls or jambs that are at even a slight angle to each other, then this is not a feasible option for you. Pressure-mounted safety gates are the most common type of gate found in homes, because of their simplicity and cost-effectiveness. In order to bring you some of the best options on the market today, I have gathered information from different brands and various websites so that you can compare and contrast what features are available. I also took into account the ratings and reviews that different gates have received from consumers, eliminating the ones with low scores, as flimsy, cheaply-made gates are a waste of everyone’s time and money. I have narrowed down my top five choices to include three for standard-size doorways and two for wide spaces. This is a great overall product with great reviews. It has all the important features that are sought in a pressure-mounted gate. It is sturdy and well-made. It has a door wide enough to easily walk through and only requires one hand to open and close. Since the door swings both ways and can be locked into an open position, it is extra handy when you need your doorway to be functional instead of locked up to keep the baby safe. It comes in a couple different color options, but the part you are really going to love is that it is a no-fuss gate that takes no assembly. Just pop it into place and get on with your life! If I had to pick one overall great pressure-mounted gate, this would be the one. It has all the basic functions and extra-mile features that I could want. It is cost-effective and simple to use. Having a gate that the toddler can’t escape through, but that I can easily walk through when needed is very important to me. This is also another great gate and the users of Amazon.com are agreed on that. It has very high ratings as far as baby gates go and is a very functional gate. Not only is it taller than a standard gate, but it looks classy with a bronze finish! The door is a bit narrower than other similar gates, so if that is an issue for you, then you might not be happy with this option. One interesting feature of this product is that it also has the option to become a permanently attached gate, not just a pressure mount. It may not necessarily be the best choice for someone who needs that particular feature, but if you like the idea of having either/or then this is definitely a plus. This is definitely a very close second choice for a standard-size, pressure-mounted baby gate. If it had a wider door, than it would be every bit as great as the North States Supergate. It is only slightly more expensive, but it is definitely well-worth the small difference if you want a fancier-looking gate that will compliment your decor. Fits: 28” – 31.5” (up to 38.5" with included extensions). Certified by the Juvenile Product Manufacturers Association, it has a lever style handle with a safety lock that provides a simple one touch release. It is metal and comes in white. The gaps between the bars range from 2-2.5” which is a nice safety feature. The door in the gate only opens in one direction and has a somewhat narrow opening at 16-17”. Additional extensions are sold separately that can make it extend up to 60 inches, if that is what your needs include. Some people have reported that it comes bent and defective, but apparently that complaint is quickly debunked, as it is designed for the latch to not fit into the door until after it has been fully installed and tightened into place. Do not let this problem deter you, as it is intentional in the design. Overall this gate has received quite good reviews and it largely liked by most purchasers. I like that it is great for a small budget and still performs nicely, without being fancy. A solid yes for this pressure-mounted gate as long as you don’t need a wide walk thru opening. This is a gorgeous extra-wide (5 foot!) gate that is as pretty as it is functional. It has all the most important features that you would want in a baby gate, including one-handed operation and a door that swings both ways. Because it is made of metal and wood it has a unique look, as well as being sturdy and strong. Keep in mind that any gate that spans this kind of distance has the potential for being less stable than a gate spanning a smaller distance. You will need to utilize the extension pieces to get it to the fullest possible length. There are not a lot of quality baby gates on the market that are this wide, so for those that have this need, it is really great that this one is available! I don’t hesitate to recommend this particular gate if you can afford it. I don’t think you’ll be disappointed. Much like the other Regalo gate, this white metal gate is different in that it is for extra wide areas! Since it comes with the extension pieces, it is ready to handle multiple openings. It is lightweight and portable and made of 100% steel. It has a one-touch release safety lock, with a door that opens in one direction. The walk-thru opening is only 16” wide, so keep that in mind if you don’t want one that is quite that narrow. Though this is a sturdy gate, keep in mind that any gate that spans a very wide distance (with all extensions in place) will not have the rigidity of a shorter gate across a narrower span. If you have a particular need for a wide-span gate, this is a solid option. It is not too expensive and holds up fairly good to daily use, with it’s all-steel construction. It doesn’t have any fancy bells and whistles, but it gets the job done and looks nice while doing it. Keep the width of the walk-thru gate in mind and if don’t mind a narrow opening, this might be a great fit for you. It received fairly good reviews, so though some people have had a few issues with it, many have been happy with this choice. Deciding on the perfect baby gate is never easy, but I hope this guide has helped you in your decision-making process. If purchasing a pressure-mounted gate is in your near future, may you have more confidence knowing what is available and what to look for. Whether you need a standard size or a wide gate, you are sure to find a workable solution that you can use while on the go!